Business chambers now inviting start-ups for membership. It was a telling comment when Prime Minister Narendra Modi on Saturday said before a large gathering of 20-something and 30-something founders of start-up companies, "This is not the first time that this auditorium at Vigyan Bhavan is filled, but this is the first time that it is filled with so much energy." Department of Industrial Policy and Promotion (DIPP) Secretary Amitabh Kant, the brain behind the 'Startup India campaign', added to the PM's observation: "I have not seen such dynamism in the 38 years of my career." Modi had held a similar marathon campaign for his 'Make in India' drive in September 2014, but that was with the traditional who's who of India Inc. Even then the PM had commented on the huge crowd, but not beyond. Industry representatives suggest that the National Democratic Alliance (NDA) government at the Centre is perhaps looking at new-economy and start-up companies as a fresh ally of sorts. The long list of sops unveiled at the 'Startup India' event was part of a package, a company executive pointed out. Ficci President Harshavardhan Neotia described the incentives for the start-up world as "an initiative to encourage entrepreneurs who are not from business families". But he added that in February the government would organise a big week-long event with India Inc on 'Make in India'. "So, I don't think the government's present engagement should be seen as the new economy replacing its (the Centre's) relationship with traditional businesses." Ajay Shriram, chairman & senior managing director of DCM Shriram and former president of Confederation of Indian Industry, believes the government is not replacing one with the other. "I think the government is adding to its association with the new economy. It's a deep addition and the government's approach to tap the energy of young entrepreneurs is in the right direction." He added the traditional business had its own focus and could not be ignored. Meanwhile, business chambers, which have primarily dealt with established industries so far, are now thinking differently, probably taking note of the increasing prominence of start-ups. "We have started inviting many young and successful start-ups to become our members," said Neotia, admitting that the chamber ecosystem had this far not been able to identify such members. Reflecting the government's mood in relation to start-ups, Finance Minister Arun Jaitley recently said, "The largest transportation company in the world does not own any vehicle and the largest retailer does not own any store." He was referring to Uber and Alibaba, respectively, without naming either. Several India Inc representatives contacted for this report did not comment. Indian-American entrepreneur Karl Mehta, founder and CEO of Edcast, said "the good news about this government is that it is engaging with not only the old but is willing to engage with the new generation, too. It is not looking at the established firms alone and discriminating against new ideas". He added that this government was not in the business of business but clear about business. A post from Snapdeal co-founder and CEO Kunal Bahl, on Twitter, summed up the new equation: "What a special feeling today! The sun rises for India's entrepreneurial future. Thank you." Ram K Reddy, president-elect and board member of TiE Silicon Valley, also pointed out that the NDA government was giving a lot of prominence to the new economy insofar as discussions on policy issue were concerned. "In the US, new economy is providing 80 per cent of all new jobs; now that is being tried here as well. A lot of dialogue is going on between us and the government right now." In fact, the prime minister's experience from his recent US visits is coming in handy. Modi had in September last year visited the Silicon Valley and met the CEOs of top technology companies. At the start-up event on Saturday, while announcing 'fests', he mentioned that he had seen it at Bay Area. His point was strengthened when Uber founder & CEO Travis Kalanick referred to Bengaluru as one of the three significant 'B's for his group; the other two were Beijing and Bay Area. Nasscom Chairman B V R Mohan Reddy explained why start-ups were important in the new ecosystem. "Start-ups in India are the third-largest in terms of numbers, next only to those in the US and UK." 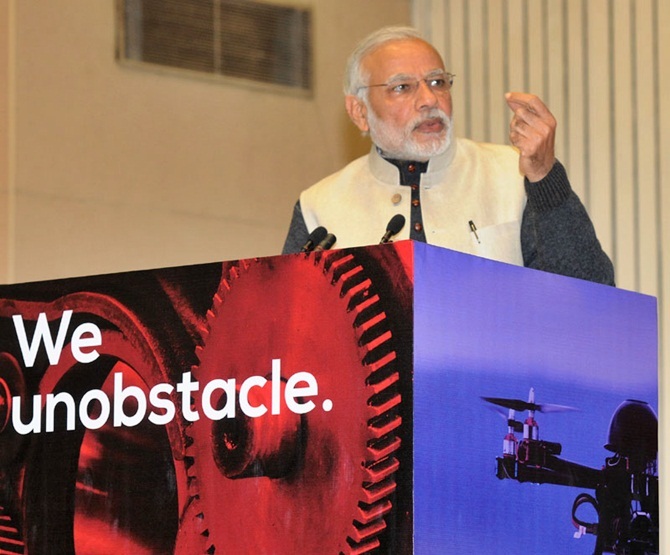 Estimates suggest that there were 4,000 tech start-ups in India as of December last year. Also important is the fact that these companies are mostly represented by people who are not even 30. It means a lot for the government to partner with them, according to an industry executive. Indeed, there have been several partnerships, and many are in the offing. Through the 'Digital India' initiative, e-commerce companies are trying to tap the far-flung rural markets. Companies like Flipkart, Snapdeal, Infibeam and Paytm have all signed memoranda of understanding with the government to reach remote parts of the country, which have so far had limited access to shops and brands. Also, the communications & information technology ministry wants to connect e-commerce companies with its common service centres (CSCs) in villages. As many as 100,000 CSCs have already been set up and the government plans to add another 90,000 by the end of March.